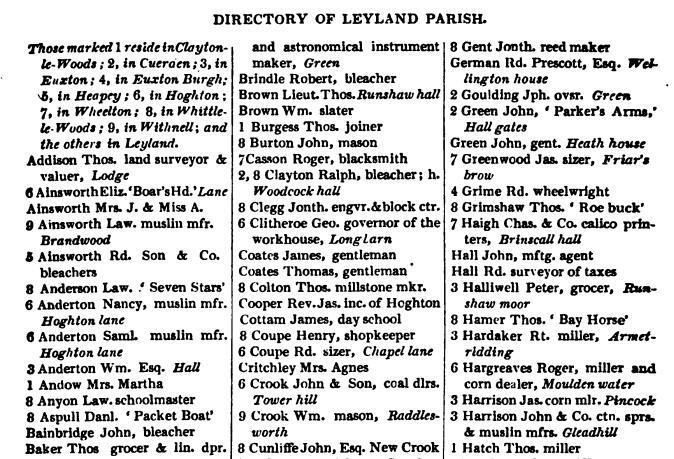 The 1824 directory is the only record I can find of a pub in Whittle of this name and it is possible that it later changed its name to one of the more familiar Inns of Whittle but sadly, I can find no other reference. The only listed landlord is therefore Law Anderson (1824). An article in the Preston Chronicle 12th May 1838 mentions an auction being held at The Sign of the Seven Stars. This is shown as the home of my 3x great grandfather Bernard Eccles who later was landlord of the Cross Keys, The Millstone and the Halfway House.